Fragile walls at Richmond Castle bear rare first-hand testimonial from men who refused to be conscripted during the First World War. 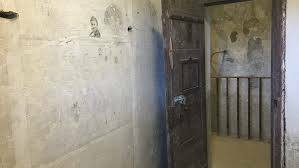 In 1916 a conscientious objector, condemned by a tribunal for refusing to serve in the armed services, took up a pencil and expressed his plight on the whitewashed wall of his cell in Richmond Castle in Yorkshire. The imprisoned men “brought the issue of conscientious objection to public attention and began to win acceptance and respect for it.” This eventually led to a more understanding approach by the authorities when dealing with those who registered as conscientious objectors during World War II. English Heritage, which cares for Richmond Castle in Yorkshire, have launched a project to record, research and preserve the fragile walls that became a unique archive of rare first-hand testimonial from men who refused to join the war, as well as thousands of other inscriptions added later. Graffiti and writing, now faded and in places illegible, that prisoners drew and wrote on their whitewashed cell walls, consist of names, messages, and drawings of loved ones, along with statements of faith. One prisoner simply wrote: “I might as well die for a principle as for a lack of one.” Many messages include references to Jesus Christ and his teachings, and there are also carefully drawn replicas of the cross-and-crown emblem, used at that time by the International Bible Students Association (IBSA). Kevin Booth, an archaeologist who is leading the project, groaned as he entered a cell with a shower of fresh white paint flakes on the floor. The first urgent challenge is to stop leaks in the stone roof above, through which water has been seeping for 150 years. “It is absolutely astonishing that so many of these have survived for a century, but they are now as fragile as cobwebs – this is the last chance to save, if we can, or at least record them,” he said. Goldsbrough was one of many conscientious objectors imprisoned in a 19th-century block house, chill even on a warm spring day, originally built against the castle’s great Norman keep as a place to lock up drunken or insubordinate soldiers from the barracks. They included Quakers, Methodists who wrote hymns on the wall, Socialists who added the words and music of The Red Flag, and a lace maker who contributed a delicate pattern for a flowery border. There are drawings of mothers, girlfriends and familiar landscapes their creators must have wondered whether they would ever see again. “The only War which is worth fighting is the Class War. The Working Class of this Country have no quarrel with the Working Class of Germany or any other Country. Socialism stands for Internationalism. If the workers of all countries united and refused to fight, there would be no war,” one prisoner wrote. At Richmond the objectors refused to observe any military discipline or do any work that could contribute to the war effort – some even declining to peel potatoes when they learned they would also feed the officers. By May 1916, some in the War Office were determined to make an example of the most obdurate, and sixteen Richmond objectors were deported to a camp near Boulogne in France. When they refused an order to move ammunition, they were court-martialled and sentenced to death, later commuted to 10 years’ hard labour. Among the Richmond Sixteen were five International Bible Students, as Jehovah’s Witnesses were then known, Clarence and Stafford Hall, Leonard Renton, Charles Herbert Senior, and Charles R Jackson. “Many of the later prisoners were serving soldiers, but it is striking that they do not damage or destroy the messages left by men whose views must have been so different,” Booth said. RL, one of the few identified prisoners – Richard Lewis Barry, a lace factory worker from Derbyshire – wrote in 1916: “You might as well try to dry a floor by throwing water on it, as try to end this war by fighting.” A 1939 writer, a soldier from the local regiment, added his initials a few inches away, but carefully preserved RL’s thoughts. Among more than 5,000 drawings, poems and texts, Booth has some favourites. He believes one elaborate drawing must have been a first world war seascape of battleships, U-boats, biplanes and a zeppelin, to which later hands have added a handsome 1930s saloon car, a trawler, Spitfires, a bomb falling on a curving path, and a caricature of Hitler floating in the clouds. The ubiquitous Private Badger has rechristened one of the ships HMS Badger. Volunteers will be recruited to record the graffiti and identify as many of their authors as possible. The names and, occasionally, addresses of many women remain a puzzle to be solved, perhaps family, or sweethearts, although it is striking that, unlike other prison graffiti, there are no pin-up drawings or crude jokes. Booth said interest in the conscientious objectors had been growing steadily in recent years. “The Richmond Sixteen has been the only story, but there is so much more in these walls”. There is a 1995 television documentary, The Richmond Sixteen which examined an important aspect of the castle’s modern history—the fate of the sixteen conscientious objectors imprisoned there. What was their story? Following Britain’s declaration of war in 1914, patriotism swept some 2.5 million men into its armed forces. In the face of increasing army casualties, however, and the realization that the war was not going to end as quickly as the politicians had promised, “recruiting became less a matter of entreaty, more a matter of pressure,” comments war historian Alan Lloyd. So for the first time in British history, in March 1916, single men were conscripted into the armed forces. The authorities were hoping the Somme offensive, from July 1916, would turn the tide. Of course, it became a bloodbath. Two thousand tribunals were set up to hear appeals, but few, if any, of those who objected on the grounds of conscience were granted total exemption. Most conscientious objectors were ordered to join the non-combatant corps, set up to support the war machine. Those who refused to join were still viewed as conscripts and were court-martialled. They were dealt with harshly and imprisoned, often in terrible, cramped conditions. Herbert Senior, who became a Bible Student in 1905 at the age of 15, wrote some 50 years later: “We were put into cells that were more like dungeons. They had probably not been used for years, as there was two to three inches of debris on the floors.” He remembers that he drew on his cell wall the “Chart of the Ages” from the book The Divine Plan of the Ages, but it has not been found. It may be lost along with other writings on walls in the main cell block or elsewhere. Another inscription still reads: ‘Clarence Hall, Leeds, I.B.S.A. May 29th, 1916. Sent to France.’ He must have realized the motive behind the clandestine move. For war casualties in France and Belgium were increasing at an alarming rate. War minister Horatio Herbert Kitchener and British General Douglas Haig desperately needed more troops, even the in-experienced, or ill-trained. 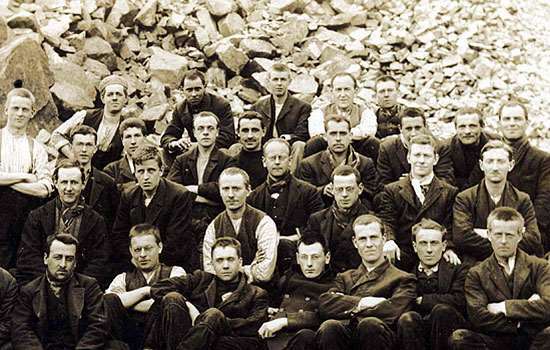 To strengthen their hand, officials decided to make an example of conscientious objectors. So at gunpoint the Richmond Sixteen were illegally loaded onto a train, their hands in irons, and secretly taken to France by a roundabout route. There on the beach of Boulogne, says Heritage magazine, “the men were tied with barbed wire to posts, almost as if they were being crucified,” and made to watch the execution of a British deserter by firing squad. They were told that if they did not obey orders, the same fate awaited them. In June 1916, the prisoners were marched before 3,000 troops to hear their sentence of death, but on 5th June Kitchener died aboard HMS Hampshire, struck by a U-boat west of Orkney, and the British prime minister Herbert Henry Asquith had intervened. A postcard with a coded message had got through to authorities in London, and the military order had been countermanded. General Haig was ordered to commute all death sentences to ten years’ penal servitude. Upon their return to Britain, some of the 16 were taken to a Scottish granite quarry near Aberdeen to do “work of national importance” under appalling conditions, says an official report. Others, Herbert Senior among them, were sent back to civil, not military, prisons. Students are encouraged to understand why conscientious objectors were prepared to suffer punishment, imprisonment, and possible execution for their sincerely held beliefs. Previous Previous post: Trust- Given or Earned?